Bombing Syria over President Bashar al-Assad's use of chemical weapons in Douma last week—as President Donald Trump promises to do—is almost an absurdity. Nearly half a million people on all sides have been killed in Syria since the civil war erupted in 2011, barely 100 of them by the regime's most recent sarin attack. Assad can mass murder civilians by the hundreds of thousands with exploding barrel bombs packed with shrapnel, but he can't gas 0.01 percent as many with a nerve agent? It barely even makes any sense and seems driven more by an emotional reaction to ghastly reports on television than anything else. And yet it makes sense. The use of any and all weapons of mass destruction anywhere in the world must remain taboo, and it can't remain taboo if it isn't punished. War is hell and always will be, but it's less hellish now than it was. The mood almost everywhere on earth during the smoldering aftermath of the two world wars was let's never do that again. Alas, the first wasn't the war to end all wars as so many had hoped, and genocide didn't go the way of the dodo after the second. Even so—and hard as it is to believe for anyone who pays even the slightest attention to news coverage—war is on its way down if not out. In his book, The Better Angels of Our Nature: Why Violence Has Declined, Harvard Professor Steven Pinker makes a compelling case that homicidal violence of all kinds (including crime as well as war) have been steadily declining for centuries and that we are currently living in the least violent era of our species' history. 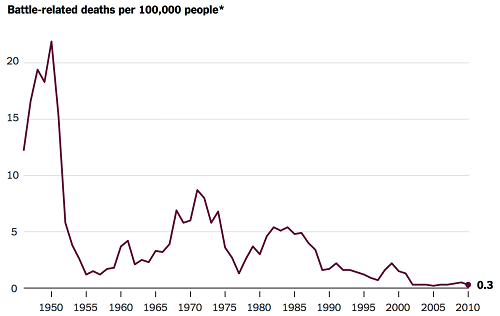 Take a look, for instance, at his graph for war-related deaths since the end of World War II. The first peak on the left represents the Korean War, the next bulge the Vietnam War, the second smaller bulge the Iran-Iraq War, and the last uptick the Second Congo War. The armed conflicts in Afghanistan, Iraq and Syria hardly even register as a blip. Everything on that graph is a blip next to World War II. That's why it isn't shown. Word War II was so catastrophically violent that everything afterward would appear as a flat line hugging the bottom. Even more people per capita were killed before the bloody twentieth century when wars and homicidal violence of all kinds were as routine as the weather. Violence has declined for a vast number of complex reasons, far too many to list in a short article, and the long decline began centuries before the dates in the graph above. Since World War II, though, an array of treaties and agreements commonly referred to as "international law" have made wars not only less common but also less brutal. The Geneva Conventions, negotiated in 1949, which protect prisoners of war from torture and other abuses. The Law of Armed Conflict, also known as the "law of war," a body of international agreements that regulate hostilities between belligerents and clearly define what is and what is not a war crime. The International Criminal Court in The Hague, which places war criminals on trial if and when their home countries are unwilling or unable to do so. The Treaty on the Non-Proliferation of Nuclear Weapons, which should need no explanation, signed in 1968 and effective in 1970. The Biological Weapons Convention, signed in 1972 and effective in 1975, prohibits the development of "microbial or other biological agents…that have no justification for prophylactic, protective or other peaceful purposes." The Chemical Weapons Convention, drafted in 1992, signed in 1993, and effective in 1997, prohibits the development, production, stockpiling and use of chemical weapons and mandates the destruction of those that already exist. Syria is a party to the Chemical Weapons Convention, which as of 2017 has eliminated 96% of the world's stockpiles, but treaties written by civilized people are worthless in the capitals of despotic criminal rogue states. Laws—or "laws," if you insist in the international realm—are nothing more than suggestions without enforcement mechanisms. Air and missile strikes aren't the only conceivable enforcement mechanisms, but sanctions and diplomatic isolation would likely have no effect whatsoever in the apocalyptic hellscape of Syria under Assad. After World War I, the now-expired League of Nations ratified the Geneva Protocol prohibiting the use of chemical weapons. It lasted for a while, but it didn't stick—Iraqi dictator Saddam Hussein used nerve agents with devastating effects during the Iran-Iraq War in the 1980s. UN investigators issued a report and a warning at the time: "It is vital to realize that the continued use of chemical weapons in the present conflict increases the risk of their use in future conflicts. In view of this, and as individuals who witnessed first-hand the terrible effects of chemical weapons, we again make a special plea to you to try to do everything in your power to stop the use of such weapons in the Iran–Iraq conflict and thus ensure that they are not used in future conflicts. ... In our view, only concerted efforts at the political level can be effective in ensuring that all the signatories of the Geneva Protocol of 1925 abide by their obligations. Otherwise, if the Protocol is irreparably weakened after 60 years of general international respect, this may lead, in the future, to the world facing the specter of the threat of biological weapons." Biological weapons have never been used on the battlefield, but Saddam Hussein did receive an implicit green light from the rest of us, and he used chemical weapons again in his genocidal Anfal Campaign against the Kurdish population in Northern Iraq. The Assad regime won't disappear or suddenly turn into a model of good government by a couple of punishing strikes, nor will the number of Syrian dead in the future be reduced even by one. Those are not the objectives. The objective is (or at least should be) making the use of a weapon of mass destruction more costly than not using it, to demonstrate not just to Assad but also to every other would-be war criminal that the norm established in 1993 on behalf of every human being will not go down without a fight. This is not what we might expect from a president who campaigned as an America Firster, but hardly any of us are mindlessly consistent ideologically.